A few days ago, the news reported a local elementary school has banned homework and other schools in the area are following suite. If only that happened when I was in school! Proponents say homework causes students undo stress leading to cheating and substance abuse plus it takes away from family time and fun. 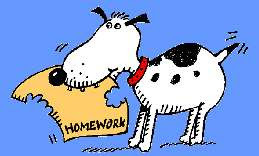 Others say homework instills responsibility and promotes what students learned in the classroom. What do you think? Will students get into trouble for having extra time on their hands or is this the right thing to do? I always thought that homework reinforced the information already taught on that day and on days prior. It's true that some schools can get out of hand with assigning homework but I think it's very beneficial. No homework, wo-ho!! Kids spend about 7 hours at school each day doing schoolwork..by the time they get home they are drained of all there energy and want to just relax and be kids. It's no different then you or I working a 7-8 hours shift..by the day's end you are tired and want to come home and relax. The last thing you want to do is more paper work. I think no homework is a good idea. Heck, maybe the kids will even do better in general in school because they won't be so drained and bogged down to the point where they don't put any effort into there work to begin with. Just my two cent's worth. Good point when you compare it against adults working 8 hours a day. Thanks. It just makes sense to me.